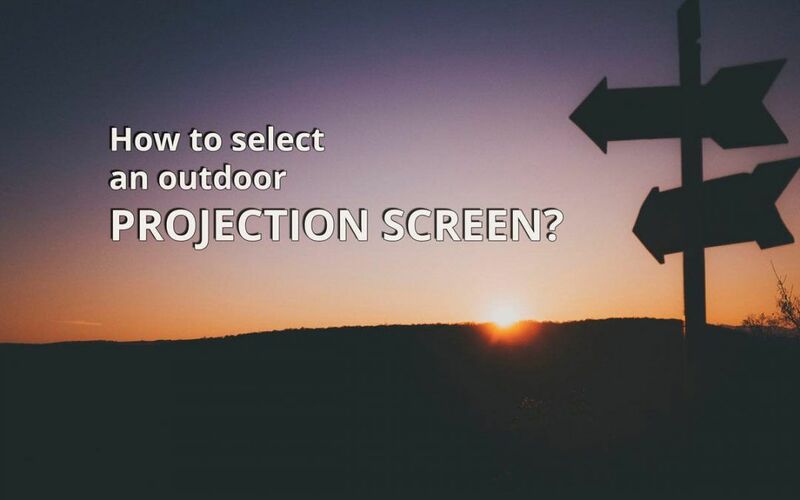 How to select an outdoor projection screen? Have you invested in a quality outdoor projector and are planning an outdoor movie party? Don’t before you read this post. 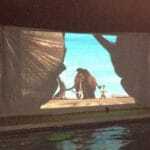 You need an outdoor projection screen as well! Many people think all they need for an outdoor cinema is a good projector, a Bluetooth speaker and a media player. The image can be projected to any white wall. Well, it’s true, but…. Using a bright outdoor projector which costs several hundred dollars to project to the garage door, to the external wall of your house, or to a hanging bedsheet is like serving Pacific oysters with a $3 wine. Don’t! There is one problem, though – with a bit of wind, these screens can easily fall down and hurt someone. Using a blockout cloth will give you better results. Still a bit wrinkly, blockout cloth is more dense then linen, and will give you a brighter image. 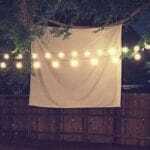 Check this very good tutorial on how to make a good DIY outdoor cinema screen. The minus with this type of the screen – you can only use it for front projection. It means you cannot place the projector behind the screen, which is a safer option when you’ve got small kids or a swimming pool. They can be fixed frame or foldable. They are nice and compact, but still not very wind proof. Some portable screens come with front projection surface only, while others can be used for rear projection as well. They take a bit of time to setup, and some models are quite heavy. Inflatable screens can be constant flow screens – they require the blower constantly running and filling the screen with air; and sealed screens. 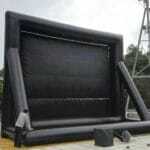 Sealed screens are inflated before the show and stay inflated for long periods of time. They are silent – there’s no blower noise during the movie! It means that the image won’t fill the whole screen surface, and everybody will see the white stripes above and below the image. Not professional at all. Unfortunately, all these defects will be seen through the projected image. The screen surface needs to be smooth – that’s why the white wall of your house will give you below average image quality. Shiny surface is no good either as it will reflect too much light – you’ll see the reflection of the projector’s lens. For outdoors, you would need higher contrast fabrics compared to the average home theatre one, and for big audiences, you need wide viewing angle with not too high gain. 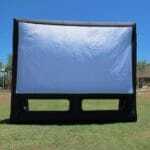 Among the vast variety of fabrics used for outdoor cinema screens, spandex (also known as lycra) and specially designed for projection quality PVC fabrics will give you the best viewing results answering these requirements. See-through fabric makes the picture less bright – the same outcome you would get from a projector with lower lumens. Black backing is excellent if you are using the screen with front projection. The bigger the screen is, the better it looks. However, many people tend to overestimate their requirements, and think they would need an 8 m screen for a backyard party. Let me tell you, a 3m wide screen will be enough for up to 150 people. If your screen is too big, it will need more storage space, and more setup time, which can steal the fun from your movie night. You want the screen which is easy to take care of. Lycra is the easiest – one simply washes it in the washing machine on the gentle washing cycle. 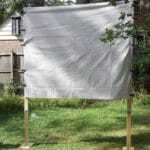 As for PVC screen, clean it with the damp cloth. To conclude, a good movie projector needs a good outdoor projection screen to match. 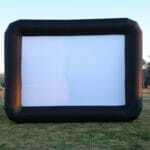 Inflatable movie screens became more affordable, but we warn you against cheap offerings which will spoil the picture. Marketing guru, event organiser and blogger, passionate about all things outdoors: hiking, camping, outdoor movies and entertainment. 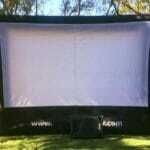 Hello – I would like a 2 x 1.14m outdoor movie screen plus the correct projector equipment to hold outdoor movie nights for our family. What do you suggest is the best for good resolution but does not cost an arm and a leg?? Hi Lynn, that’s a great idea and the perfect way to get the family together. We have plenty of different solutions to fit a budget, one of our sales staff will be in touch with you directly to assist you with finding the perfect cinema equipment.